The Rise And Fall Of Michael Flynn The former general was known as a talented officer in the U.S. wars in Iraq and Afghanistan. But in Washington, he was dogged by a strange and contradictory relationship with Russia. President Trump's national security adviser Michael Flynn leaves federal courthouse in Washington on July 10. Flynn has pleaded guilty to lying to the FBI and is scheduled to be sentenced later this month. "The demands on the United States intelligence system have skyrocketed in recent years, and these demands are only expected to increase," Flynn testified to Congress. But since that time, Flynn has been on a roller-coaster ride. He is back in the news again as Robert Mueller's investigative team announced Tuesday that Flynn was providing substantial cooperation in the inquiry into possible collusion between Russia and President Trump's 2016 campaign. Flynn pleaded guilty in December 2017 of lying to the FBI and is scheduled to be sentenced on Dec. 18. The prosecutors are recommending that he not serve any prison time. Before he encountered legal trouble, Flynn had a brief and difficult tenure at the Defense Intelligence Agency. Many previous military assignments emphasized Flynn's skills as a can-do officer in the field. As director of DIA, he had to be more of a manager and a strategic thinker. Flynn clashed with President Barack Obama's White House about how the U.S. was waging its wars. He felt the president was not aggressive enough and needed to take a more comprehensive approach, as he wrote later in his book. "We can't win this war by treating radical Islamic terrorists as a handful of crazies," Flynn wrote. "The political and theological underpinnings of their immoral actions have to be demolished." After just two years at DIA, Flynn was ousted; he retired from the Army. He set up a private consulting firm and represented a number of foreign clients — including some with controversial ties in Turkey — which he didn't disclose at the time. But above all, Flynn had a strange and contradictory relationship with Russia. "When we think about countries like Russia, countries like Cuba, countries like Venezuela, Iran, North Korea, I mean, these are — in many cases, these are criminal enterprises that — that have dictatorships and certainly tyrants," Flynn told NPR in August 2016. Yet only months earlier, Flynn was wearing a tux at a high-profile dinner in Moscow where he sat next to Russian President Vladimir Putin. Flynn was paid more than $30,000 for a speech. So what did Flynn really think of Putin? "There's no reason to believe Putin would welcome cooperation with us. Quite the contrary, in fact," Flynn said in the summer of 2016 in the audio version of his book, The Field of Fight. At that very same time, Flynn was a top adviser to candidate Donald Trump, who kept raising the possibility of improved relations with Russia. Flynn also began to soften his harsh take on Russia, suggesting the two countries could work together in some instances, like cooperating to battle Islamist radicals in the Middle East. His most memorable campaign moment came when he spoke about Hillary Clinton at the Republican National Convention. "We do not need a reckless president who believes she is above the law," Flynn said. Then he joined the raucous crowd in chants of "Lock her up, lock her up." A few months later, as Obama was preparing to leave office, he reportedly warned Trump not to make Flynn the national security adviser. But Trump did so — and problems began before the newly elected Trump was in the Oval Office. Flynn spoke with the Russian ambassador to the U.S. in December 2016 — and then lied about it to the FBI. He resigned after less than a month on the job and pleaded guilty to lying a year ago. Trump says Flynn has been treated unfairly. "I feel badly for Gen. Flynn. I feel very badly," Trump said. "He's led a strong life." Flynn has been out of the headlines for the past year. But the documents released Tuesday say he has spoken with Mueller's investigative team 19 times. 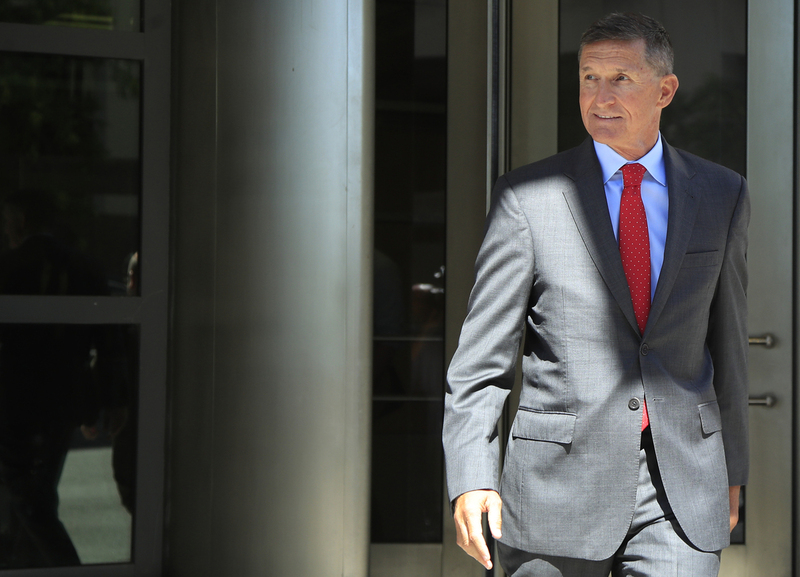 Prosecutors cite that cooperation, and Flynn's military career, as reasons the judge should show leniency when he is sentenced later this month. A previous version of this story incorrectly spelled a reference to Robert Mueller's last name as Muller.